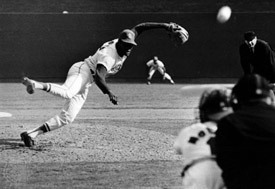 40 years ago today in the first game of the 1968 World series, St. Louis Cardinal ace Bob Gibson set a World Series record. Gibson struck out 17 Detroit Tigers in a 4-0 complete game shutout. As a high school senior in St. Louis, I watched the end of the game during the last two classes of the day, including the final inning when Gibson struck out the side. Gibson was 22-9 that year with a modern day ERA record of 1.12 for a starting pitcher, a record likely never to be broken. He also pitched 28 complete games (13 of them were shutouts), an anomaly in an age when a starting pitcher does something unusual if he pitches 2 or 3 complete games the entire year. Gibson also holds the World Series 7 game total strikeout record of 35, also set during the 1968 series. In three World Series (1964, 1967 and 1968) Gibson had a 7-2 record with a 1.89 ERA. He also holds the World Series record for consecutive complete games (8) and consecutive wins (7). Gibson is second on the all-time World Series career strikeout list with 92, just 2 behind Whitey Ford. However, Gibson pitched only 82 World Series innings in comparison to Ford’s 146. Gibson was definitely a big-game pitcher. Unfortunately, one of his 2 World Series losses was the 7th game of the 1968 World Series, which was another complete game for him.